With the delicate palates of children in mind, the producers at Nobleza del Sur created this wonderful extra virgin olive oil. Consisting primarily of oils from the Arbequina olive variety, well-known for its soft, fruity notes, this blend has a naturally sweet flavor designed to delight children of all ages. Produced from estate-grown olives harvested early in the season, the oil maintains a high phenolic content, making it a healthy and delicious afternoon snack to serve with bread, cheese, and fresh tomato. It’s also a great option as a first baby food! 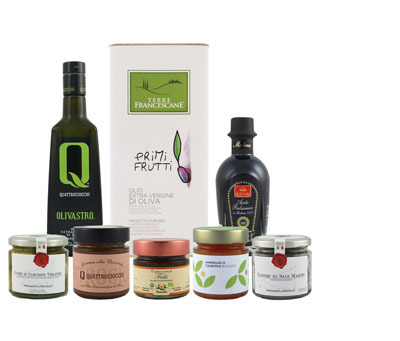 This blend of Leccino, Frantoio and Moraiolo oils compliments any refined gourmet experience. A fruity, green and herbaceous oil made from 100% Picual olives. A fruity, sweet and harmonious oil with flavors of the plants that coexist among the olive trees. This "Micro Farm" gift set contains three sustainably-farmed monocultivar organic oils. Organic monocultivar Picual oil sustainably-farmed near Seville, Spain.